The exhibition portion of On Whiteness aims to take advantage of art’s powerful ability to reframe dominant ways of seeing, especially with regard to philosopher Sara Ahmed’s postulation of whiteness as a “habit,” whose power to form and sustain specific social behaviors and institutions resides in its being taken entirely for granted. As Ahmed proposes: “Whiteness is what bodies do, where the body takes shape of the action…. spaces are oriented ‘around’ whiteness, insofar as whiteness is not seen.” By disorienting the particularly habituated space of the white cube gallery, the work in this exhibition questions, marks, and checks whiteness, challenging its dominance as it operates through default positions in cultural behavior. Artists include: Josh Begley, Paul Chan, Mel Chin, Ja’Tovia Gary, Ken Gonzales-Day, Kate Greenstreet, Titus Kaphar, Baseera Khan, Charlotte Lagarde, Seung-Min Lee, Glenn Ligon, Mores McWreath, Sandeep Mukherjee, Native Art Department International, Toyin Ojih Odutola, Tim Rollins and K.O.S., Cindy Sherman, Rodrigo Valenzuela, and Anicka Yi. A day-long symposium featuring conversation on the diagnostics of whiteness, with keynote addresses by Linda Alcoff, Nell Painter, and Patricia Williams; presentations including Vijay Iyer and Claudia Rankine and panelists including Lauren Berlant, Sadhana Bery, Daniel Borzutsky, Rizvana Bradley, Jane Caflish, Jeff Chang, Chris Chen, Aruna D’Souza, Lori Gruen, Saidiya Hartman, Sarah Lewis, and Doreen St. Felix. A series of performances examining what Iyer terms the “affective archeology” of systemic racism, combining audio interviews he has conducted with artists of color with live performance with a host of collaborators across open rehearsals and evening performances. Jackie Sibblies Drury will use her time in the space to begin a new project, experimenting with text and developing a movement vocabulary in collaboration with other artists that explores how physical comedy and violence are written onto and interact with the black body. She will open her process to the public through in-process showings and casual feedback sessions. Dark Noise Collective will use their time together as a retreat, focusing on internal writing workshops, artist talks, and discussions around race and theways that their work disrupts white dominance. They will also host a public performance at The Kitchen, consisting of poems that have been generated during the residency and other work. Tickets available July 9 at 2pm. Marguerite Hemmings looks at relationships that are in need of examining, i.e. audience-performer; institution-artist; whiteness-everything else? Audience members will be asked to join the circle and participate in guided and unguided improv exercises with sound and movement facilitators. Seung-Min Lee’s performance takes on the conflicted symbolic power of milk; as the once-booming dairy industry in New York state suffers with the steady decline of milk consumption, a new generation of Neo-Nazis takes pride in lactose tolerance, instrumentalizing the optical purity of milk as a emblem of white supremacy. 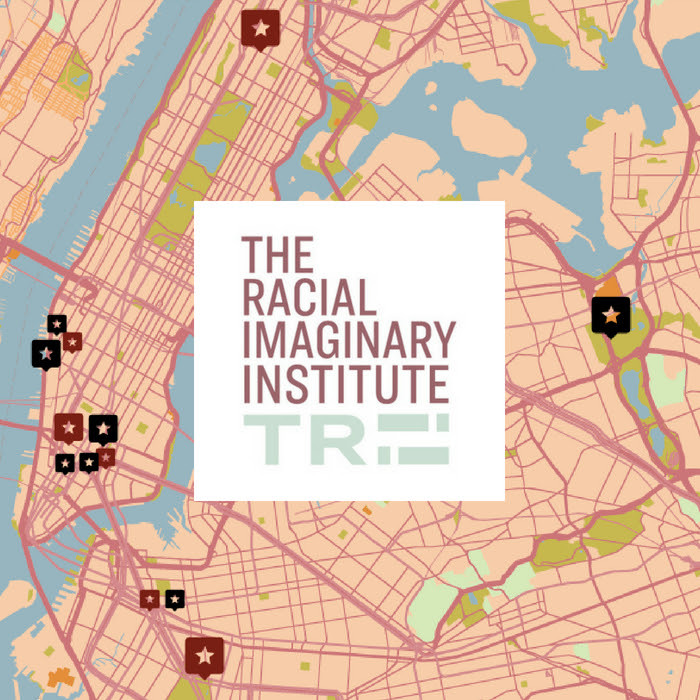 Cultural institutions, collectives, individuals, arts spaces, and other curatorial venues have responded to The Racial ImaginaryInstitute’s invitation to invest in examining the racial imaginary in their programming during the months of June and July 2018. Participants include 47 Canal, BAM (Brooklyn Academy of Music), Drawing Center, Helena Anrather Gallery, theMuseum of Chinese in America, New Museum, Jack Shainman Gallery, Recess, Studio Museum in Harlem, Queens Museum, and the Whitney Museum of American Art. Click here for a full schedule of happenings. Artists in the exhibition include Josh Begley, Paul Chan, Mel Chin, Ja’Tovia Gary, Ken Gonzales-Day, Kate Greenstreet, Titus Kaphar, Baseera Khan, Charlotte Lagarde, Seung-Min Lee, Glenn Ligon, Mores McWreath, Sandeep Mukherjee, Native Art Department International, Toyin Ojih Odutola, Tim Rollins and K.O.S., Cindy Sherman, Rodrigo Valenzuela, and Anicka Yi. This exhibition is presented as part of The Racial Imaginary Institute: On Whiteness. For more information about the exhibition and other programs please see The Kitchen’s website.